Are You Excited About What You Do? Last week Gallup released a new poll noting that half of American adults work full time for an employer, but only 13% who are working full time are actually excited about what they do. I trust that our school communication professionals — a spirited, creative and exciting group — would rank their jobs much higher than the 13% that this latest Gallup poll found. I have said many times that my stint as a VP in the corporate agency business was one of the best experiences I have had during my career. I learned a great deal more about leadership, sales, customer service, how to make or lose money, and how to make our programs accountable and successful. But even though we were successful, somehow I felt that our work there was a bit hollow contrasted to working for our school community. I was impressed with the results and recommended that we highlight this work as a general interest story that demonstrated the humane side of their practice. Well, let’s just say that this idea turned into a “dog that did not hunt.” The client did not want to promote their repair and restoration work because it was not the type of work that they wanted to be known for. And they were correct. Strategically I was off target. We regrouped and offered more relevant and profitable procedures for their prospective clients. This approach worked and our business relationship with them blossomed into a viable one for our agency. But I wasn’t excited about this work. It felt hollow after working in a local school district and for two education associations. I realized that most of us get into education to help students and staff improve through engagement and communication. We also enjoy building more support for our local systems. And when our work makes a difference, we get even more excited about it. Now I know we all have bad days and we experience circumstances that are out of our control. But even during those times, we are there to help improve and possibly provide solutions to protect the reputation of our systems. It all depends on what we value and how we practice our profession. Most NSPRA members enjoy the opportunities to help their systems in authentic and results-oriented ways. In fact, I’ll bet most NSPRA members I know even get excited about their work. Unlike those unlucky people in the Gallup poll. As we approach our holiday break, most of us are a bit frantic “to get it all done.” NSPRA member jobs are always busy, but when you add the layer of personal and family holiday shopping and home responsibilities, it may seem like we added just another stressful and unforgiving deadline we need to meet. But we all need a break from the stress. Let’s do our best to take advantage of being away from the everyday pressures of our school communication jobs and return from the holiday break refreshed to tackle the new challenges that we face for the remainder of this school year. A new collaborative software tool we are calling NSPRA Connect, where you can post your own request for assistance or counseling and hopefully receive numerous relevant responses from NSPRA colleagues. You will have access to more than 1,700 PR consultants who face nearly the same situations you face every day. The new system goes to the heartbeat of NSPRA — members networking to help one another. Watch for it later this spring. We’ll also be co-publishing two books by respected NSPRA veterans, Kristin Magette, APR, and Trinette Marquis-Hobbs, APR. Kristin is updating her Embracing Social Media book and Trinette is working on a data-based approach to school communication. Our co-publisher, Rowman & Littlefield, is setting publishing deadlines. We are keeping our fingers crossed to have both publications by our Anaheim Seminar in July. Plus, we’ll be publishing the second edition of Making and Marketing Your School as a School of Choice in time for the Anaheim Seminar. The book’s focus is to help school leaders make their individual schools winners when it comes to our era of competition, which seems to be growing through the advocacy of federal and state legislation and funding. Our plan is to have the book ready this spring. Early in 2018, we will be offering a new collection of past webinars and EduTalk Radio shows in our Members-Only section of our website. Entitled Play That Again …, this section will be a collection of NSPRA members’ insights on a wide-range of evergreen issues and practices. Also starting in January will be a new electronic version of NSPRA’s popular Wit and Wisdom, where members offer their brand of wit and wisdom to be shared through NSPRA’s Twitter account. Finally, we plan to have a new communication review process to be available by the NSPRA Seminar in July. Targeted for smaller school districts, these reviews will give districts the use of SCoPE surveys and e-interviews and focus groups to help them set the course for effective communication practices in their districts. We’ve nearly completed two beta projects with NSPRA districts that will lead to the new service to be launched next year. It is a busy year for all of us, but we should take pride in what we do every day for our students, their districts and communities. Nobody does it better on a consistent basis than NSPRA members and their districts. Enjoy your holiday and let’s make 2018 a year of accomplishment for our school communication profession. Every superintendent needs one of these gifts to be successful. In fact, every school board member should make sure they provide the motivation and support to make this gift a reality. So, what type of gift are we talking about? It’s the gift and insight of a professional school communicator. Just look at the advice our savvy members gave when we created a poster a few years ago entitled NSPRA Members Know. Tradition is a guide — not a dictate. Experience allows you to ask the right questions. People make mistakes and what happens next is the important thing. Managing your community’s expectations is perhaps the most important thing you can do. Stay organized and positive during the budget season. Campaigns are not about issues, they are about voters. That being strategic makes everything else fall in place. When to give the person being interviewed the high sign to STOP TALKING. How to stay calm in a crisis and provide communication leadership. Having a brochure and a video isn’t a communications strategy. If you are not taking care of students, you’d better be taking care of someone who is. Trust starts by being human, and builds by being honest. The joy of seeing a child recognized, a parent helped, and a community proud. That it is important to have communicators at the decision and planning table. If we don’t stay in touch, we will soon be out of touch. Most successful superintendents understand the true value of a seasoned communicator at their side. In today’s world of instant communication, fake news, and self-anointed expert bloggers searching for followers, they understand the critical role of a school communication professional. It’s time to give superintendents the gift of a professional communicator. You can start with a free kit for superintendents on starting a program and follow it up with a free subscription to Communication Matters for Leading Superintendents. You can find both of these items on our website at www.nspra.org. And to continue to receive weekly advice in a clear, concise and brief format, become an NSPRA member or subscriber through our website. We wish you all a great holiday season and brief respite from the stress of leading our schools through some perceived rocky political times. Together let’s make 2017 a year in which we continue to do what’s right for all our children and where we clear a path for more support of public education. Share your Wit and Wisdom quotes and celebrate NSPRA's 75th Anniversary! One project to celebrate our 75th anniversary will be to publish the second edition of The Wit and Wisdom of PR Success. The first edition, published in 1995 and then reprinted in 1998, captures the wise and sometime humorous witticisms of leaders in our PR profession. 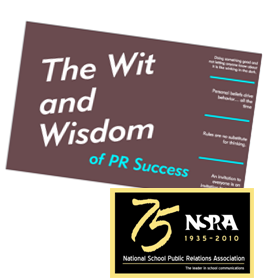 Now you can submit your personal contributions to the next edition of NSPRA’s The Wit and Wisdom of PR Success. You just need to verify that your submissions are your original work or cite the appropriate source if it isn’t. Email your submission to editorial@nspra.org by March 15th. Nope, we’re not talking about the upcoming budget battles this spring. We’re talking about getting proactive and creating your own version of “May Madness” to ignite a buzz about the accomplishments of your students, staff, and schools. Right now, most schools with elite athletes are participating in a National Signing Day, where stellar athletes sign their letters of intent about their college choice and the scholarships that go with them. Some colleges send coaches to the signing event and the athletes often wear caps and jerseys of the college they select. It’s a fun and proud moment for a handful of super athletes and their schools. National media coverage by ESPN and others add to the celebratory hype of this day. You should go to the next step and have your district or high schools participate in a different kind of National Signing Day. Have all of your students announce their next steps. Credit for this “big idea” to prove our schools are working goes to Cleveland Plain Dealer columnist Regina Brett, who urged Ohio districts to do the same in one of her past columns. Picture it. Your high school auditorium is packed with underclassman and one by one graduating seniors announce and sign their letters of intent. You need to decide how far you would want to go, whether you announce just scholarship winners or celebrate all students’ next career paths. You can highlight those who will attend college, enlist in armed forces, or take special training to advance technical and occupational careers. It’s up to you to decide what would work for your school and community. Invite the media. Invite dignitaries to the event and capture their responses for this day of achievement. Record video and stream it on your website. Use the footage to make a promotional video for your schools that can be shown at community group meetings, the Rotary, Chamber of Commerce, and Realtor meetings and open houses for recruiting new students and parents. The only limit is your creativity and, of course, time and money. People often ask me what the weakest characteristic of most school communication programs is. It’s that we are reactive and not proactive. We need to be more proactive and offer positive triggering events that are aligned with the goals of our schools. Preparing students to win at their next level is one major component of what we are all about. Be proactive. Celebrate accomplishments. Trigger positive comments about your students and staff. Start marching toward your own May Madness program today.